Merino Wool Scarf is one of the very popular item in Nepal Mithila Women Handicraft. It is made up of 60% merino wool and 40% of silk. Although it is very thin it's very warm.It is available in different colours and different designs. We can make your own design if it is possible. It is one of the most popular and fashionable item. These items are completely Hand made In Nepal.Made from Merino soft wool.Available in assorted color.. These items are completely Hand made In Nepal.Made from Merino soft wool.Available in assorted col.. Flower Merino wool ScarfFelt Merino scarf are completely Hand made In Nepal.Made from Merino soft wo.. 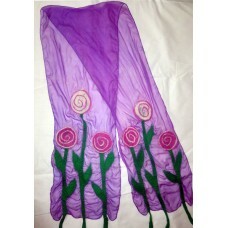 Felt Merino scarf are completely Hand made In Nepal.Made from Merino soft wool.Available in assorted.. Leaf Flower Merino wool ScarfFelt Merino scarf are completely Hand made In Nepal.Made from Merino so.. Leaf Merino wool ScarfFelt Merino scarf are completely Hand made In Nepal.Made from Merino soft wool.. Spotted Merino wool ScarfFelt Merino scarf are completely Hand made In Nepal.Made from Merino soft w.. Tie die Felt Merino scarf are completely Hand made In Nepal.Made from Merino soft wool.Available in .. Washed Felt Merino scarf are completely Hand made In Nepal.Made from Merin..